Can't say I'm happy about the choice of benchmark to fix, but it's good to see things getting fixed. not starting on a x470 whit 200ge cpu on win10. Did you try to run as admin? The source of HWBOT Prime is under our control, so it's the easiest to fix. Any chance of having it check against HPET to make it useable on 8/8.1/10? Or is that what the fix was already? First thing I attempted, however right click doesn't have run as admin option. Why not integrate one fixed java version like with X285 ? Thanks! Which cpu are you using? The batch file is not working for me with W7 or W10 (run as admin of course). I also tried to run the command via admin CMD but it has the same result, it will not launch and CMD closes. However, I can run the .jar file without the batch file and all is good...but perhaps it needs to be run via batch file for 'cheat detection'?? As you can see, real-time priority stabilizes the score but ultimately it doesn't produce as the highest runs. 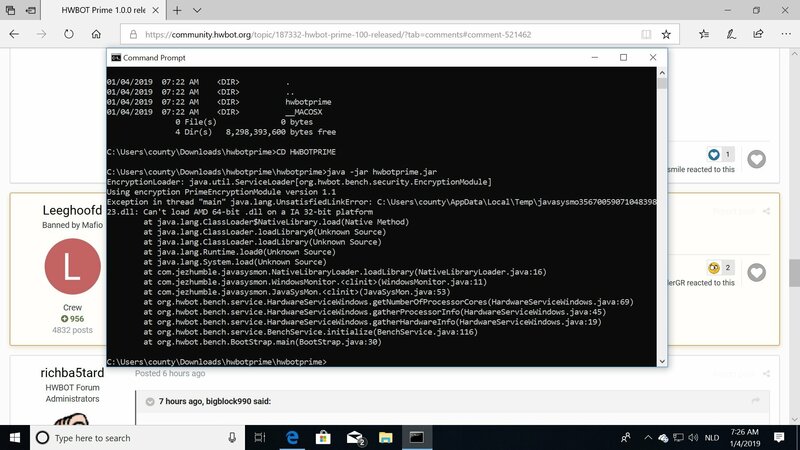 after intalling JRE 9ea+107 the cmd window opens and immediately closes and the GUI doesn't run. Previously had JRE 8u191 and it worked fine although the the checksum result after uploading was "invalid" and the result did not show up in the results for the CPU used (Core i7 4600U) but has a gold cup with the result being 1st out of 1. Uploading a result from 0.8.3 was fine: http://hwbot.org/submission/4030594_cbjaust_hwbot_prime_core_i7_4600u_3721.32_pps/ and it shows up normally in the rankings for i7 4600U CPUs. Edit: nevermind, uninstalling JRE8 stuffed up the paths in windows and the java couldn't be found. Adding the path to java in the batch file fixed it. For oldschool need Java7 :0 is it possible to add this support? 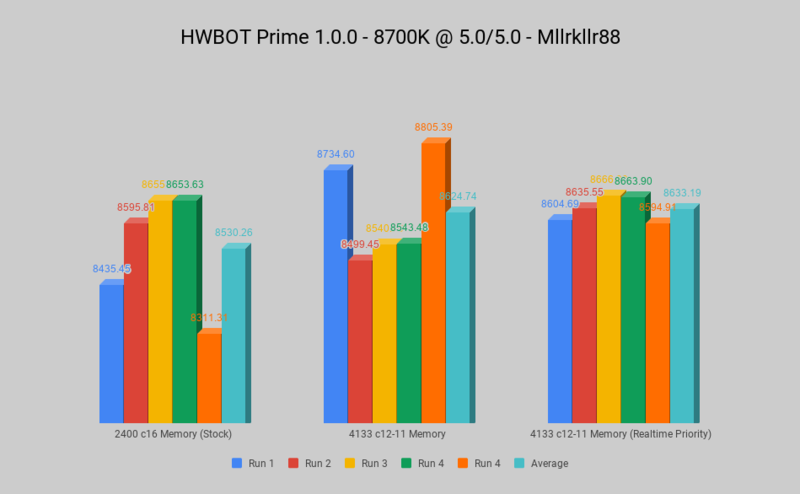 Couple days ago i behch 6xPentium Pro [url=http://hwbot.org/submission/4029265_], now with "old" hwbot prime[/url] it was total fun, what will be in fiture? 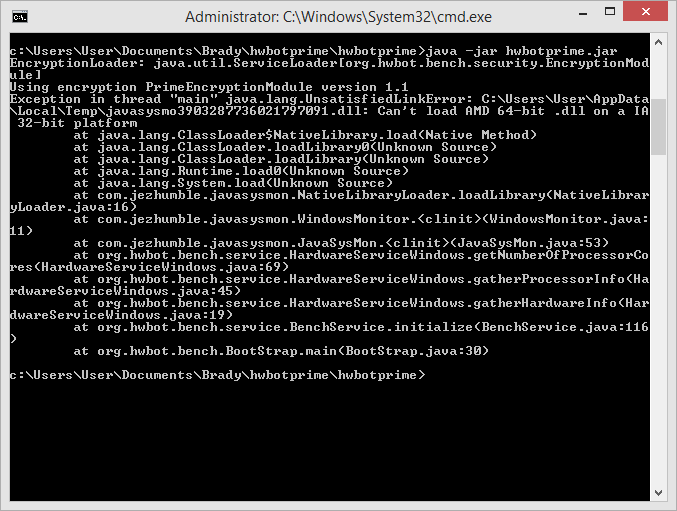 I've updated the java sysmon library but it seems to give issues on some windows machines. I'm going to revert the change. Can I suggest we reopen the upload page for HWBot prime as a seperate v 1.0+ benchmark and have it as a finite beta period. After which time all results are removed the database. This would allow for people to run the benchmark and for us to upload results to better find bugs and abnormalities. Also being clear up front that all results from the beta period will be cleared means we won't have any potentially bugged runs in the database after such time is over and people can't complain when the results are removed. I follow your reasoning @ObscureParadox but v1.0.1 is a tiny bit slower (due to cheat detection), not faster. As long as there are no algorithm changes I don't see a good reason to go through a beta period, same for the other benches.